1. How many committees of five people can be chosen from 20 men and 12 women such that each committee contains at least three women? We must choose at least 3 women, so we calculate the case of 3 women, 4 women and 5 women and by addition rule add the results. 2. Which of the following statement(s) is/are false? 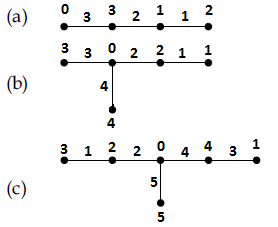 (a) A connected multigraph has an Euler Circuit if and only if each of its vertices has even degree. (b) A connected multigraph has an Euler Path but not an Euler Circuit if and only if it has exactly two vertices of odd degree. 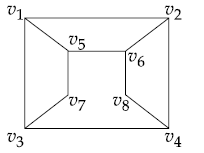 (d) A cycle over six vertices (C6) is not a bipartite graph but a complete graph over 3 vertices is bipartite. From the above definitions, we can see that (d) is false. So answer is (D). 3. Which of the following is/are not true? (a) The set of negative integers is countable. (b) The set of integers that are multiples of 7 is countable. (c) The set of even integers is countable. (d) The set of real numbers between 0 and 1/2 is countable. A simple graph G=(V,E) is called bipartite if its vertex set can be partitioned into two disjoint subsets V=V1⋃V2, such that every edge has the form e=(a,b) where aϵV1 and bϵV2. Bipartite graphs are equivalent to two-colorable graphs. 1. Assign Red color to the source vertex (putting into set V1). 2. Color all the neighbours with Black color (putting into set V2). 3. Color all neighbour’s neighbour with Red color (putting into set V1). 4. This way, assign color to all vertices such that it satisfies all the constraints of m way coloring problem where m = 2. 5. 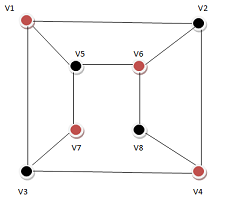 While assigning colors, if we find a neighbour which is colored with same color as current vertex, then the graph cannot be colored with 2 colors (ie., graph is not Bipartite). So answer is option (C). 5. 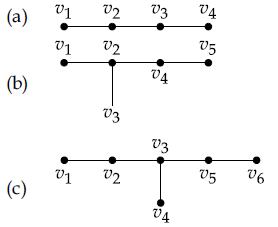 A tree with n vertices is called graceful, if its vertices can be labelled with integers 1, 2, ...,n such that the absolute value of the difference of the labels of adjacent vertices are all different. Which of the following trees are graceful? From the above figure, we can see that (a), (b) and (c) are graceful. 6. Which of the following arguments are not valid? (a) “If Gora gets the job and works hard, then he will be promoted. If Gora gets promotion, then he will be happy. He will not be happy, therefore, either he will not get the job or he will not work hard”. (b) “Either Puneet is not guilty or Pankaj is telling the truth. Pankaj is not telling the truth, therefore, Puneet is not guilty”. (c) If n is a real number such that n>1, then n2>1. Suppose that n2>1, then n>1. 7. 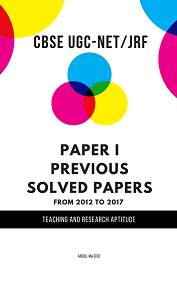 Let P(m,n) be the statement “m divides n” where the Universe of discourse for both the variables is the set of positive integers. Determine the truth values of the following propositions. that proceeds by showing that q must be true when p is true. that proceeds by showing that p must be false when q is false. Which of the above propositions are tautologies? 10. Which of the following property/ies a Group G must hold, in order to be an Abelian group?